I’ll never forget Sunday, February 13th 2011. Around noon I was having a conversation with the pastor on my way out of church. We were talking about a small group starting that was going to be centered around Rick Steves’s book, Travel as a Political Act. So after watching Sleepless in Seattle for the first time that evening, (It was the day before Valentines Day and for the record I was yawning not crying at the end, I was yawned and my eyes began to water) I turned to my wife and said, “Let’s go somewhere.” She thought I was joking. At first she thought I meant that we should go down to Chicago to enjoy the museums on Valentine’s Day. But then I told her I wanted to really go somewhere and to get me from changing my mind, we need to go fast. One of the highlights of the trip was going to the Vincent Van Gogh Museum. I’m not much of a museum guy. There are world famous museums in Chicago that I haven’t even been to. But I loved the Van Gogh Museum. What made the Van Gogh museum so special was the story it told. Not only is it the largest Van Gogh collection in the world, the museum did a wonderful job of crafting Van Gogh’s life story. I’m a writer and Van Gogh’s a painter but I learned a lot from seeing how he created. The following are 7 notes that I made about creating after I walked out of the museum. No matter what you create (computer code, blog posts, marketing material, paintings) there’s a lot to learn from the life of one of the greatest creators of all time. Van Gogh started painting at 26. He had very little experience before this. 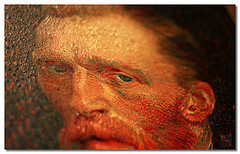 Van Gogh painted 1,000 different paintings in just ten years (He committed suicide at 36). That’s an average of one painting every 3.65 days for ten years straight. Once Van Gogh committed to painting professionally, I don’t imagine too many days he didn’t paint. The reason Van Gogh created still lifes was because that’s what people bought. Van Gogh worked closely with multiple mentors. He tried to take what his mentors did extraordinarily well and apply it to his own work. Van Gogh deliberately painted what was out of his comfort zone, so it could become part of his comfort zone. Thanks for the post. Van Gogh was an amazing artist. I like your points on his life and how he created his success. His passion for his work lives on today in all of the works he created. It is amazing to think that he painted so much in such a little time. Our financial situation should be like that as well. Create for ten years then reap what we have sown and save for our futures. It doesn’t always work out that way but Van Gogh gives a great example in that even if you are getting started late in life planning for your your future you can still make it happen. He created his amazing works in just 10 years and so can we. The initial anecdote nearly made my jaw drop. As an undergraduate, I came home from class one day and told my friend we should go somewhere. A few hours later we booked a trip to Amsterdam, for New Years. It would become one of the most memorable experiences of my life. We spent about 5 days there (stopped by the Van Gogh Museum as well!). Hope your trip was just as surreal. As for the list, numbers 1, 3 and 6 are my favorites. I try to live by those principles every day!